You can use absolutely any pan or skillet that you have handy for making crepes. The one condition is: if you are a beginner at make crepes, it needs to be non-stick. Yes, you find that crepes can be made on stainless steel pans. Yet, it is much trickier to find the right level and distribution of heat, and more constant greasing of the pan is required for the batter to not stick. Crepe batter is very thin and delicate. Above is a photo of my usual pans. 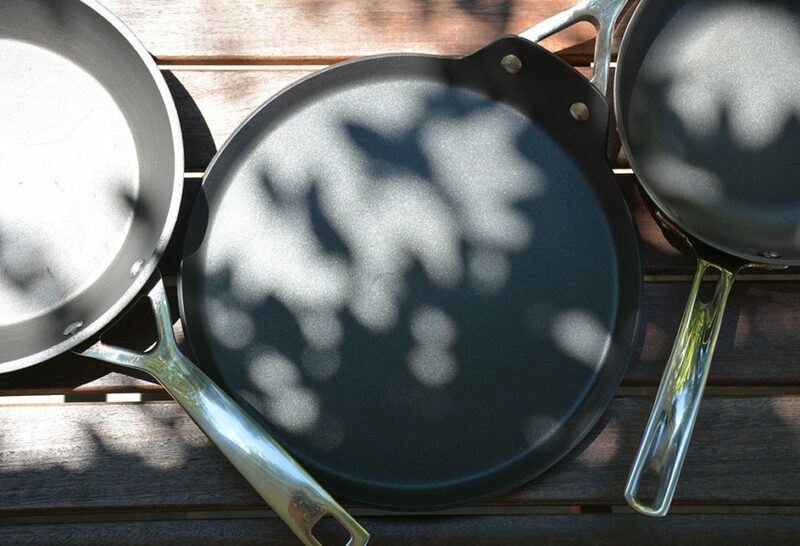 The middle one is a 10-inch crepe pan, which has shorter sides. The other two are normal non-stick pans of smaller sizes. You also need a good reliable recipe. Here you go: Basic Crepe Recipe. And then you need to consider that the smaller you make the crepes, the easier it will be to spread the batter and flip them. Since the sides of the pan act as a natural border for the thin batter, as you tilt the pan and spread the batter, it is much easier to make them the size of the pan and beautifully round. Some crepe pans come with a special crepe dough spreader, or rateau, to help spread the batter evenly. I find it works just as well to pour the batter on one side of the pan and quickly tilt it, so the batter covers the rest of the pan. The larger the pan, and the larger the crepes, the more challenging it is to flip them as they cook. This is why you see the crepes being flipped with the large wooden sticks at crepe stands, where gigantic crepes are made on special electric or gas crepe griddles. Crepe makers fold the crepe that has cooked on one side over the stick to help them flip it to the other side. You can purchase an electric crepe maker, similar to the griddles in the stands, for home use as well. However, if you use an 8- or 10-inch non-stick pan, you are set on the right path. After you master making that size, you can opt for larger ones.